While driving through Hackney recently I came across this group of social deprivation warriors, and like or loath them if properties weren’t left empty by landlords or disgracefully unoccupied by local councils, squatters (who often have not broken any laws) would not exist. On closer inspection I was surprised to find this once elegant early Victorian detached house had a plaque attached to its gatepost ‘The Elizabeth Fry Refuge 1849-1913’. 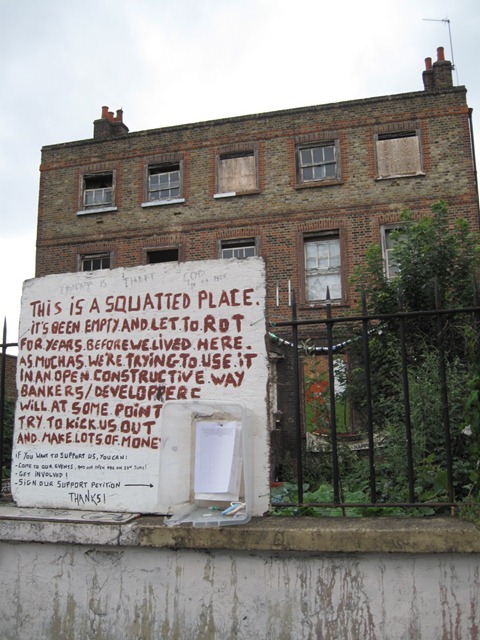 The irony of squatters living in Elizabeth Fry’s Refuge has obviously escaped Hackney Council’s attention. Born in Norwich on 21st May 1780 Elizabeth was the daughter of John Gurney a partner in the famous Gurney Bank, her mother was a member of the Barclay banking family and a devout Quaker who would help the poor of the district every day. As a young woman Elizabeth’s friend was Amelia Alderson whose father was a member of the Corresponding Society Group advocating universal suffrage and annual parliaments. In July 1799 she was introduced to a fellow Quaker, Joseph Fry a successful merchant’s son. They married the following year move to Plashet (now East Ham in London) and she bore him eight children. In 1813 a friend of the Fry family, Stephen Grellet, visited Newgate Prison. Grellet was deeply shocked by what he saw but was informed that the conditions in the women’s section were even worse. When Grellet asked to see this part of the prison, he was advised against entering the women’s yard as they were so unruly they would probably do him some physical harm. Grellet insisted and was appalled by the suffering that he saw. When Grellet told Elizabeth about the way women were treated in Newgate, she decided that she must visit the prison. There she discovered 300 women and their children, huddled together in two wards and two cells, the female prisoners slept on the floor without nightclothes or bedding. Although some of the women had been found guilty of crimes, others were still waiting to be tried. Elizabeth began to visit the women of Newgate Prison, supplying those clothes and establishing a school, and later with other Quakers formed the Association for the Improvement of the Female Prisoners at Newgate. Her brother in law published an inquiry into prison discipline and upon being elected as an Member of Parliament, he addressed Parliament and pointed out that there were 107,000 people in British prisons, greater than all the other prisoners in Europe put together – it is also a greater number than in today’s prisons. Elizabeth gave evidence to a House of Commons Committee, describing how Newgate held 30 prisoners to a room each prisoner had a space of 6 feet by 2 feet, with hardened offenders sharing rooms with first time offences. At a time when over 200 offences were capital offences she declared ‘capital punishment was evil and produce evil results’. When Sir Robert Peel became Home Secretary he introduced a series of reforms directed at introducing more humane treatment of prisoners as a result of pressure from Elizabeth. Elizabeth also became concerned about the quality of nursing staff. In 1840 she started a training school for nurses in Guy’s Hospital and Florence Nightingale wrote to Fry to explain how she had been influenced by her views on the training of nurses. Later, when Nightingale went to the Crimean War, she took a group of Fry nurses with her to look after the sick and wounded soldiers. It is claimed that Queen Victoria, who was forty years younger than Elizabeth Fry, might have modelled herself on this woman who successfully combined the roles of mother and public figure. Although prison reform was her main concern she also campaigned for the homeless in London. So when you have a £5 note in your hand turn it over, there you will find Elizabeth Fry, Quaker, prison reformer, campaigner for universal suffrage and champion of the poor and homeless, it’s just a pity that Hackney Council don’t try their best to follow her lead. 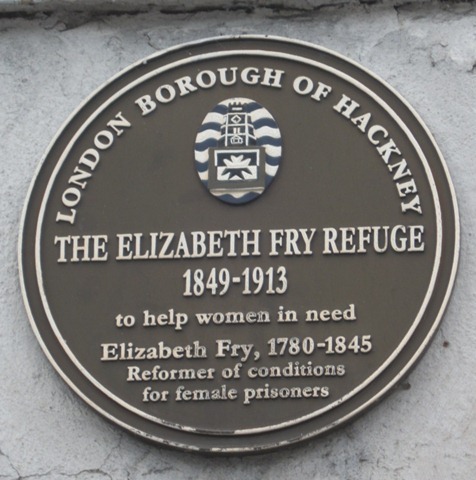 great article i was recently thinking about that place, plaque and who is Elizabeth Fry Refuge now i know she was great person in my opinion all hackney resident should be proud of that and shame to hackney council they dont care about this building at all. i hope someone will wake up in hackney town hall which is not far away from historical place and squat in one. Thanks for your comment on CabbieBlog.